My living room sofa has been decorated with the two pillows that came with it and matched the upholstery since I purchased it, oh, about 15 years ago. Talk about a design fail! But last week I started to change that. I have been thinking about new pillows for a while and decided to combine that project with the growing pile of old jeans I've collected. 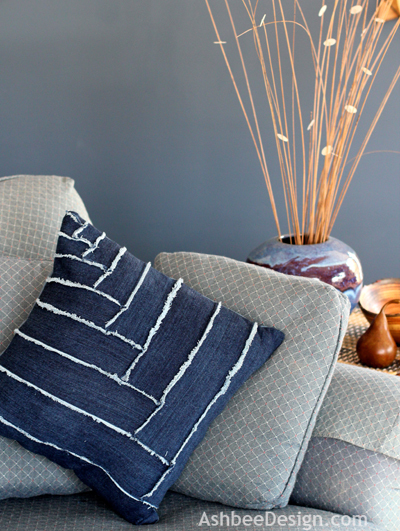 One of the main accent colors in my living room is denim blue. 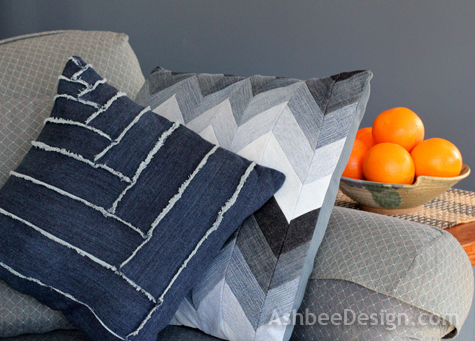 My first pillow was the chevron pillow that pieced together ombre shaded stripes. It is stunning and visually very strong. 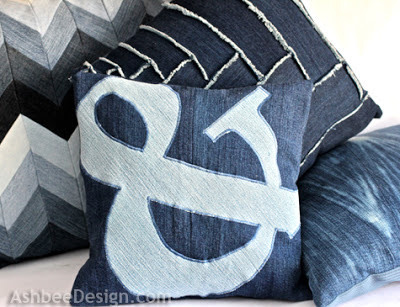 I knew a complementary pillow needed to have a subtler pattern so as to not overwhelm the room. 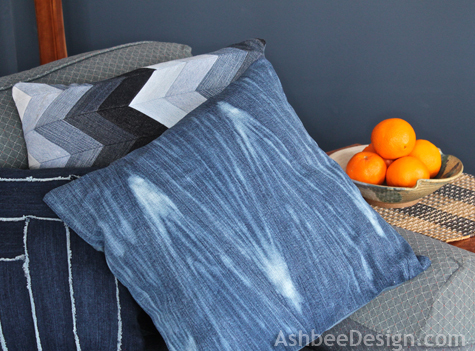 I decided to use all one color of denim in this pillow but to use the soft lines created by unraveling the fabric as the accent point. It is a great second pillow for my couch. I used a log cabin type quilting pattern but with rectangles of descending sizes to create a contemporary feel to this rustic material. 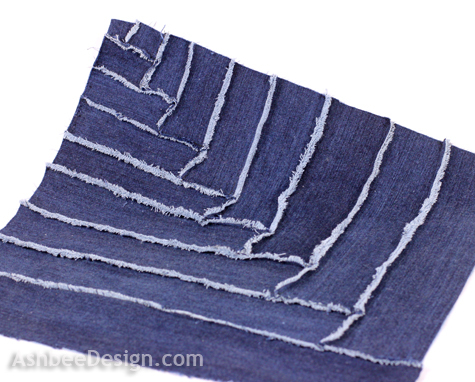 Each of the seams has been frayed to form a soft, fuzzy line. 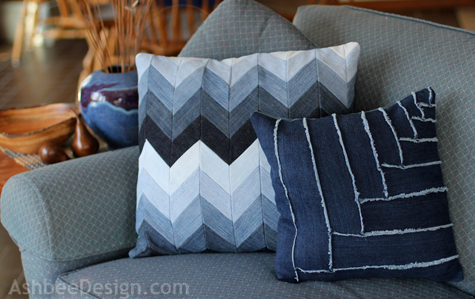 And, like the chevron pillow before it, I will provide a tutorial on how I created the pillow cover. 1 Pair of Old Jeans, preferably well washed and soft. 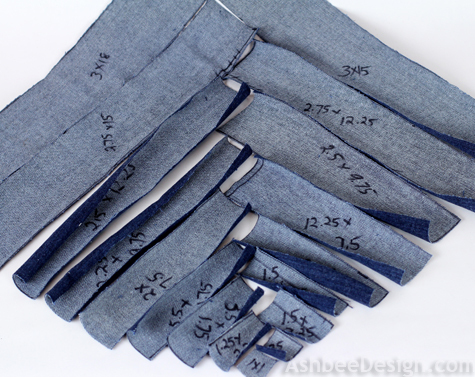 Cut the legs off the old jeans, removing all seams and hems. 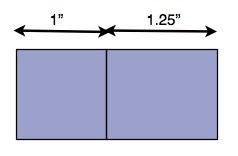 Measure and cut them carefully. Here are all the pieces cut and laid out in their assembly pattern. I did write the size on each to help keep me organized. 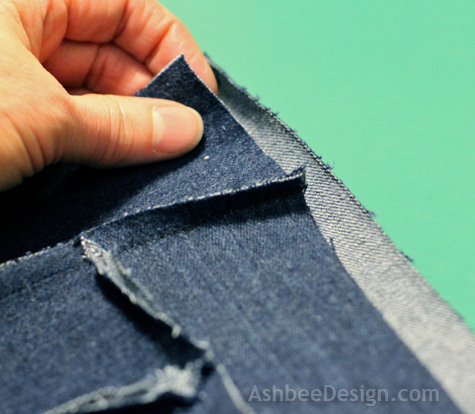 Start assembly by sewing the 1" edges of the two smallest pieces together but sew with WRONG sides of the fabric together. You want the seam on the front. 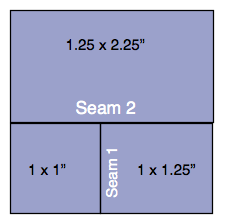 Sew with a 1/4" seam allowance. Be consistent on this for all of the seams on the front. 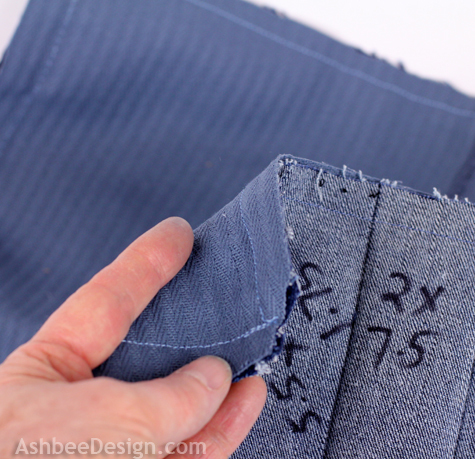 Add the 1.25 x 2.25 piece matching the back sides of the fabric together and placing it across the side with the seam. Stitch it again with wrong sides together. 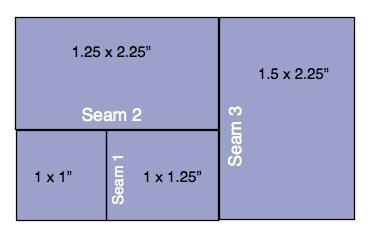 Add the 1.5 x 2.25 piece, again with wrong sides together and placing it across the edge with the two pieces and 1 seam. This is the pattern you continue to follow, always adding the new piece across the side that has 2 pieces and one seam. And always sewing them with the back sides together. 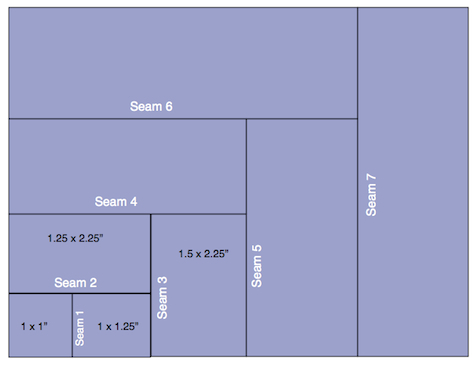 Here is the seam plan continuing out. Continue with this pattern until all pieces are attached. It will look like this on the backside. Now it is time to start fraying! Just start picking at the threads on the front of the seams. This is a messy job so hae a wastebasket nearby! 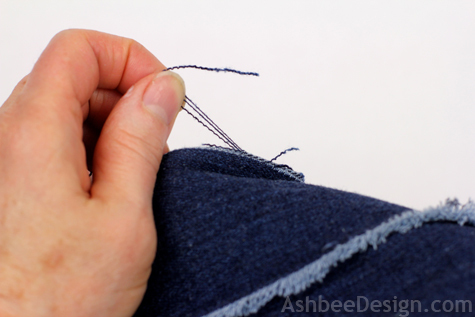 As you work your way closer to the seam it will be hard to grab the threads to pull. I used a needle to help losen the thread. 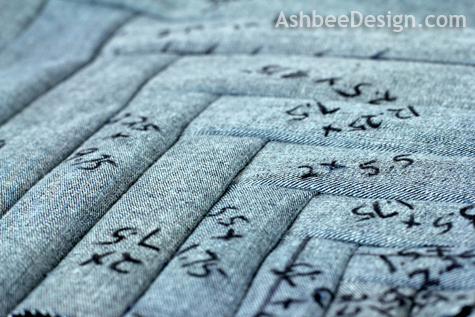 You want to unravel the seams about 2/3's of the way down to the stitched seam. If you go too far you can compromise the strength of the seam. Keep pulling threads until all the seams are soft and fluffy. 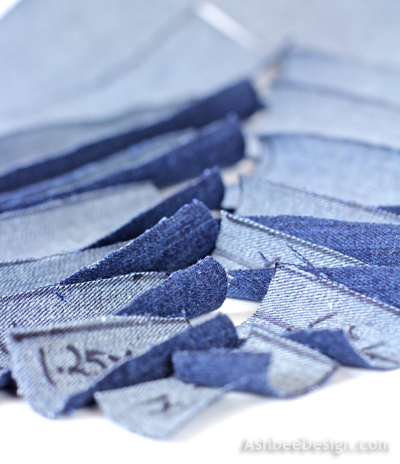 You will notice that you can't unravel the denim across the end cuts. I just cut those a little shorter, frayed the piece butting up to it, and visually they blended in. 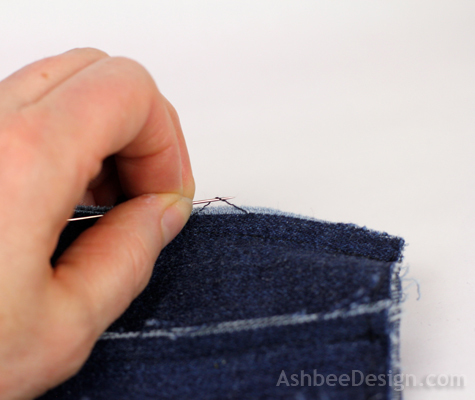 Cut your backing fabric large enough to cover the back side. Mine was split in the middle with an opening held closed by velcro. You can follow that style, or any other pillow encasing technique depending on what supplies you have on hand. Stitch the backing to the front of the pillow cover - this time with RIGHT sides together. 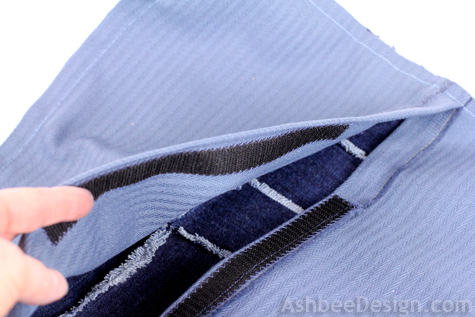 Clip the corners before turning right side out and inserting the pillow. Here are my two new pillows together.... They definitely need a third, and probably one at the other end. I like the combination of the two techniques yet with a similar material. I will think about a third technique for the next one. I also like a variety of sizes and shapes. Maybe the next one will be cylindrical. That's a good shape for under the neck when relaxing on the sofa. The next ones also needs to no have a striped design but something different. Glad I have a huge pile of jeans.....and no, I haven't made a dent into the pile yet. Update 3/1/2013: I made the third pillow using bleaching techniques. See how here. You pillows are amazing! Thank you so much for sharing, I may have to makes some! Pinning! And thank you so much for you sweet comment on my blog! I am very pleased with how they turned out and am hoping to make some others in different styles but all with that pile of jeans! Love this idea! 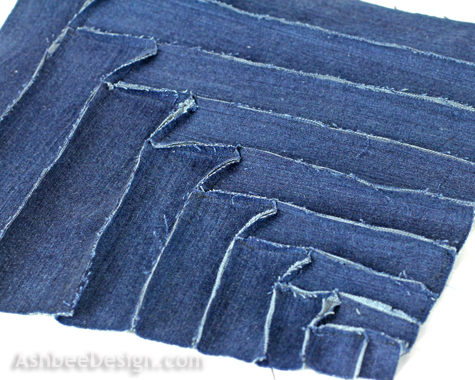 I always get drawn to the denim quilts and other things you can make with old jeans. I definitely want to try this one day. Wish I'd saved my kids jeans. It would have been fun to make them a pillow from their kid jeans. Hello Chrissy and thanks for visiting and commenting. 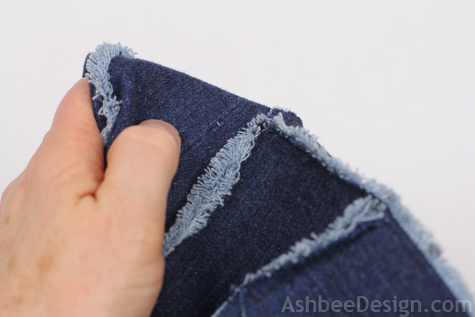 Check out my series on using denim. 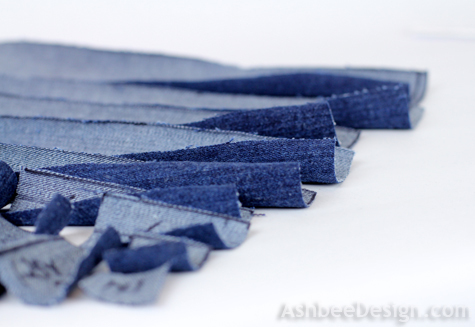 I have collected sooooo many denim ideas. It is good to finally be putting them into action! Cute pillow! I love the dark denim! Yes, I wanted to contrast with the last pillow. Thanks for visiting and commenting. OMG, this is gorgeous!!!! I would buy it in a heartbeat (yup,I'm no sewer)! Fantastic, great job! I make pillows because they cost SO MUCH! But I love looking at all the ideas and then using that for inspiration. Thanks for visiting and commenting. really cute! love the different versions!!! Thanks - more to come!!! #1 is still my favorite as well. I have ideas 2 and 3 done, am set on#4 have and idea for #5. We'll see if #1 stays the favorite. Brilliant idea!! You are so creative! Thank you! Working hard to get it going again after so many years of minimal crafting. This is awesome!! Now I'm going to go through all of the jeans that don't fit and start using them! Send photos when you do!!!!! This is the BEST!! I am always looking for relevant, repurpose jean ideas. With three kids I have an endless supply of jeans with a hole in the knee :) I am adding this to my list!! We are starting a link up party on Thursdays (today:), and we would love for you to join us with this post and/or any others you would like to include. We are at allthingswithpurpose.com. Hope to see you there! !